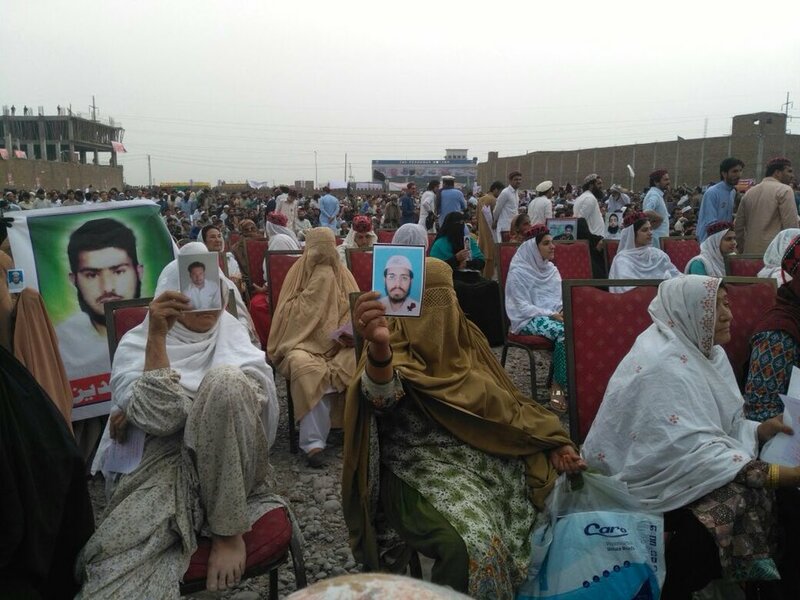 PESHAWAR: Thousands of people flocked to the Peshawar Ring Road on Sunday to take part in a gathering organised by the Pashtun Tahaffuz Movement (PTM) with a unanimous demand of release of missing persons as well as the provision of basic human rights to the Pashtun community in Pakistan. “In Karachi, money is taken in return for bodies. Even Genghis Khan did not take money after killing people,” Pashteen said. “After Rao Anwar (the ex-SSP Malir accused of the extrajudicial murder of Naqeebullah Mehsud), it is now the turn of Ehsanullah Ehsan (former TTP leader),” he said, demanding that the erstwhile TTP spokesperson should be brought to the courts. “After Ehsanullah, we will bring [former president] Musharraf to the courts,” he added. “In Waziristan, the ‘good Taliban’ are threatening the people,” he said. Pashteen demanded that the practice of imposing curfews in FATA should come to an end, and that schools and hospitals under occupation should return to their usual course of action. 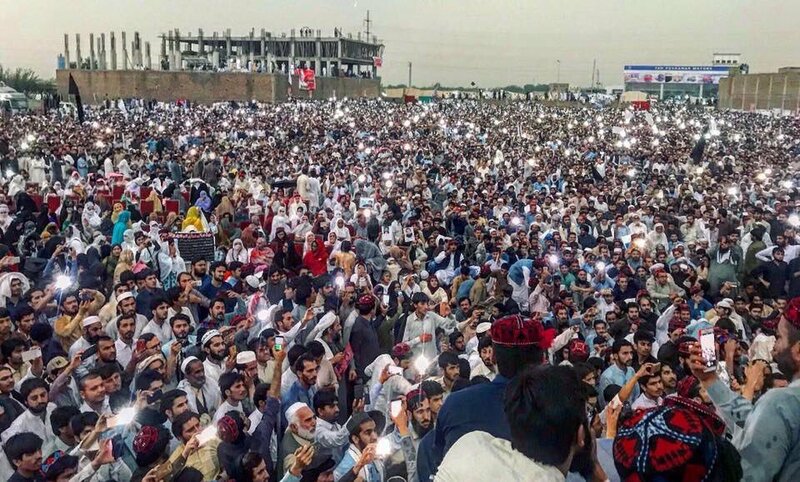 “We will go to every village until our demands are met,” Pashteen announced, adding that more rallies will be organised in Karachi, Hyderabad, Loralai and Bannu, followed by a sit-in in Islamabad. He also announced that a gathering named “Jalsa Raddul Fasaad” will be held on April 22 in Lahore, whereas another one in Swat on April 29 will be called “Raah-e-Raast”. 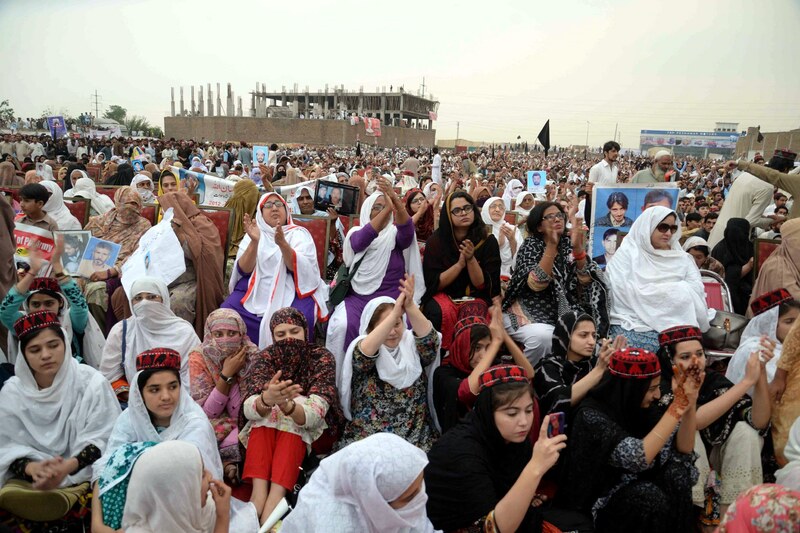 The Islamabad sit-in would end only after an international guarantee, Pashteen told the audience. He also said that a rally will be taken to Waziristan after Ramazan. “We have to give the coming generations a bright future,” he concluded. The PTM, which emerged on the map after protesting in the federal capital against Naqeebullah Mehsud’s murder in a fake encounter, announced the gathering to emphasise and remind authorities concerned of its demands. The gathering is protesting against the ‘VIP’ security Rao Anwar has managed to secure despite his suspicious behaviour and his alleged role in the extrajudicial killings. The movement is also highlighting the issue of curfew imposition in FATA, asking for the practice to be terminated due to its negative effects on the everyday lives of normal citizens, as well as, demanding the recovery of missing persons, presenting them before the court, removing landmines and basic human rights available to the rest of Pakistani citizens. The PTM has been issued a no-objection certificate (NOC) by the administration of Peshawar despite threats of a possible militant attack which are likely to occur in gatherings and the imposition of section 144. The rally is taking place a day after a ban on Pakistan Zindabad rally in lieu of a treat alert from the Counter Terrorism Department (CTD). People from all over Khyber Pakhtunkhwa (KP) and FATA are together, chanting the slogan: Da sang Azadi da (what kind of freedom is this). 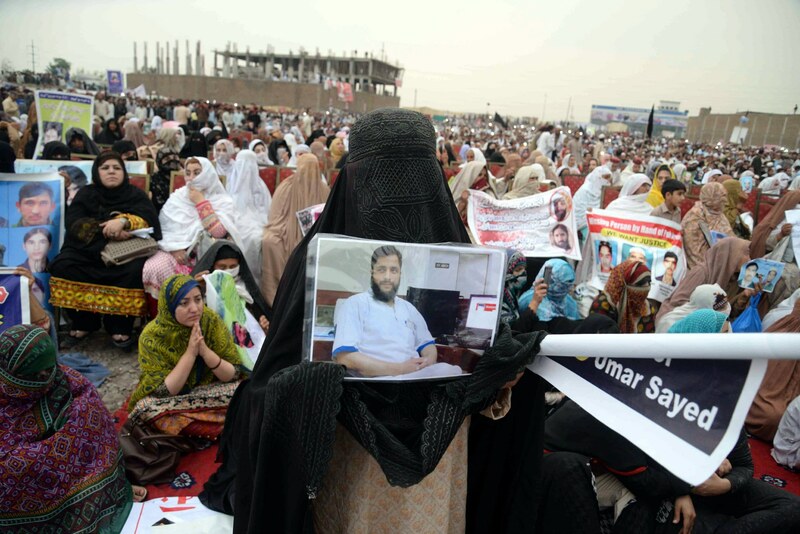 Addressing the gathering earlier, PTM leader Sanna Ejaz demanded a closure of National Logistics Cell units in Torkham, Chaman and Ghulam Khan, and the return of properties in Swat and Malakand. “The people of tribal areas should be given the same rights as the people of Lahore and Islamabad,” she said. Other speakers reiterated their right to facilities of hospitals, schools and colleges in FATA and vowed to stand for rights within the ambit of the Constitution. “Sindhis, Baloch and even the oppressed Punjabis are looking towards you today,” said a speaker in Urdu and added that Manzoor Pashteen is a beacon of hope for the country’s oppressed. Surprisingly, the Pakistan Telecommunication Authority suspended internet services in and around the venue of the rally, thus creating hardships for media and organisers, while the district administration already imposed a ban on holding of rally with enforcement of Section 144. The PTM’s official Twitter page updated followers with the news coverage will be a problem. They alleged that “internet connectivity was being constantly interrupted by the state”. It is pertinent to mention here that except Pakhtunkhwa Milli Awami Party of Mahmood Khan Achakzai, nationalist parties including Awami National Party remained absent. Similarly, Jamaat-e-Islami was also absent on the occasion. Pakistan Tehreek-e-Insaaf (PTI) had earlier supported the PTM, but just a day ago, its leader Shah Farman directed party workers to remain at a distance from Sunday’s rally.